TODAY marks the end of the first 5 weeks of the semester and the last day students can drop a class. Congrats to the varsity scholastic bowl team for going 3-0 last night defeating Tri-Point 290-40, Shiloh 390-20 and Deland-Weldon 350-180 improving their overall record to 25-8. The JV went 2-1 on the night defeating Tri-Pt and Deland-Weldon and then lost to Cornerstone to improve their overall record to 9-13. Leading the varsity in toss-ups was Tyler Maxwell with 22 followed by Luke Nichols and Mitchell Houser with 6 each, Josephine Aldrich with 3, Zach Cahoe with 2 and Conner Otto and Hutchence Partlow with 1 each. The JV was led by Grace Coffey's 5 toss-ups on the evening. The scholastic bowl teams are back on conference play tonight taking on LSA and Sangamon Valley in Decatur at 5pm. Go knights! If you are in the spring play, please see Miss Yeagle sometime before the end of the school day today to get your script for Charlie and the Chocolate Factory! out on Friday! If you’ve been gone and have returned all your made-up assignments, please have your teachers fill out the sheet in the office and bring back to the office the signed sheet. On Friday, we will observe the 2:20 bell schedule and have advisories and be dismissed at regular time. BRHS Key Club and Kiwanis Club of Farmer City will host their annual chili supper at Blue Ridge High School, 411 N. John Street, Farmer City THIS FRIDAY from 5-7 p.m. Cost is $5 per person for chili, drink and dessert. Proceeds will go toward community service projects. Come out for some delicious chili - a good deal for a great cause! Friday is Senior Basketball Night and Senior Cheer Night! Come and root them on to a WIN!! The Class of 2021 is selling window decals as a Prom/Post Prom fundraiser. Forms are available in the office. Decals are available for all Blue Ridge sports/activities! The deadline is February 11th. Tickets for the Valentine’s Dance are available through next Thursday, February 14th. Tickets are $5 per person, and are available before or after school in Ms. Loop’s room, or in the Commons during lunch. See a Spanish club member for tickets. 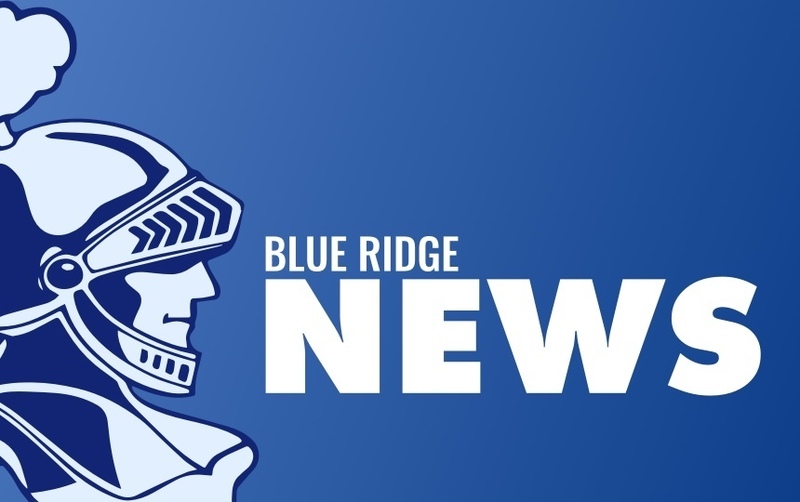 Be sure to vote for the 2019 Blue Ridge Sweethearts. Participating couples are as follows: Justin Williamson and Alicen Herald; Cole Stephens and Farrah Michaels; Avery Fisher and Georgia Manuel; Hank Mitchell and Jamie Wanserski; and Grace Coffey and Abby Johnson. Votes are 25 cents each and may be placed at the same time as ticket sales. Good luck to all five couples! The Student Council is taking orders for Valentine’s Day Carnations from February 7th thru 12th in the commons at lunch. Flowers will be delivered 8th hour on Valentine's Day. Purchase 1 flower for $2 or 3 for $5. Proceeds benefit the Sunshine Center. The CEO Field Trip for most of our Junior Students has been rescheduled for next Thursday, February 14th. The next FFA meeting is February 13th in the Ag room. Committees are at 6pm and the chapter meeting is at 7pm. It’s pancake time again! The Class of 2022 is selling Applebee’s pancake breakfast tickets for $5 each. It is on Sat, Feb 23 from 8-10 a.m. at the Champaign location on North Prospect. Last night, the Varsity Scholastic Bowl team dropped two close matches to Monticello and Lexington before rebounding to defeat Delevan to round out the evening moving their overall record to 22-8. The JV split last night, losing to Cornerstone, then defeated Delevan. Leading the varsity in toss-ups was Tyler Maxwell with 14 followed by Luke Nichols with 12, Josephine Aldrich with 3 and Hutch Partlow with 1. The JV was led in scoring by Connor Otto's 6 tossups. The Knights Scholastic Bowl teams are back at it tonight with the first toss-up at 4:30pm. Go Knights! After school detentions this week are with Mrs. Givens.